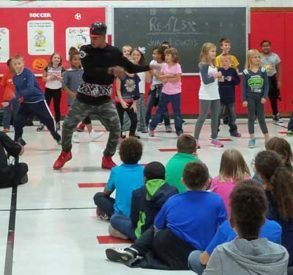 “REFL3X”, Quad Cities local Hip Hop group recently spent three days at McKinley Elementary teaching all students Kindergarten through 5th grade dance moves. The students enjoyed their experience and time with the group and were very excited to show off their new talents to the rest of the student body. 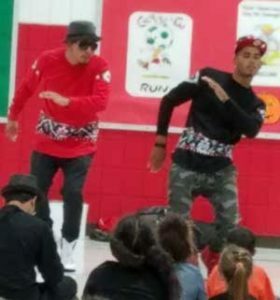 Mr. Vincent, principal had this to say, “Curtis Bell and Juan Valtjerra did an amazing job working with our students. 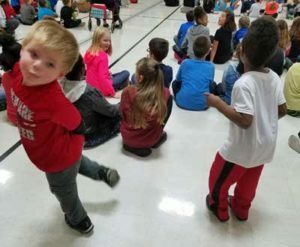 Their message is uplifting and the connection they make with the students is top notch.” Mrs. Hawley a 1st grade teacher at McKinley got to see firsthand how great the experience was. “What great positive role models that our students had the opportunity to work with.” McKinley is very thankful to have had the opportunity. It would not have been possible without the generous donation from the districts partner, artsBASICS, our non-profit arts education organization, who sponsored the experience. The mission of artsBASICS is to increase access to all of the arts to Davenport students. 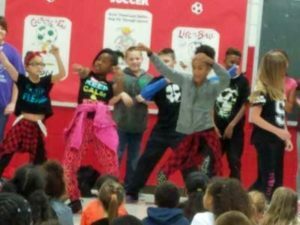 “REFL3X” spent 3 days at Jackson Elementary School this past week. Enjoy the photos from the final presentation for parents. We will share from Harrison Elementary School after “REFLEX” spends 3 days with their students as well. Stay tuned!